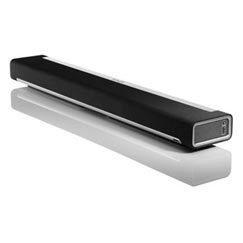 The Sonos Playbar is a 9-speaker soundbar that connects to your TV or other device using a digital optical audio cable. The Playbar can also stream music on a PC or internet radio via an ethernet connection. LG BH7440P review - The LG BH7440P is a home cinema system with a Blu-Ray player and a full 5.1 speaker system. The design is very stylish and contemporary. Connectivity includes 3 HDMI ports, Wi-Fi, DLNA and USB. The player supports upscaling to ultra HD 4K. LG NB2530A review - The LG NB2530A is a 2.1 channel soundbar with a built-in subwoofer. Total output is 100W. LG NB3530A review - The LG NB3530A is a wireless soundbar with a separate subwoofer for enhanced bass. Total power output is 300W. LG NB4530A review - The LG NB4530A is a premium wireless soundbar with a dedicated wireless subwoofer for enhanced bass. Total power output is 310W. Panasonic SC-HTB20 review - The Panasonic SC-HTB20 is a soundbar with a separate subwoofer for added bass. This soundbar includes HDMI connectivity with ARC (Audio Return Channel. The main speaker can be separated into two speakers and can be wall mounted too. Panasonic SC-HTB527 review - The Panasonic SC-HTB527 is a mid-range soundbar with HDMI connectivity with ARC (Audio Return Channel) and a dedicated wireless subwoofer for extra bass. Panasonic SC-HTB570 review - The Panasonic SC-HTB570 is a powerful home cinema system. It can be configured as a soundbar with a dedicated subwoofer, or as separate stereo speakers plus subwoofer. The unit can be connected wirelessly to your TV. Panasonic SC-HTB65 review - The Panasonic SC-HTB65 is an entry-level soundbar with stereo speakers and a dedicated subwoofer in a single bar. The unit adds depth and clarity to any TV. Panasonic SC-HTB770 review - The Panasonic SC-HTB770 is a highly versatile home cinema system. It can be configured as a soundbar with a dedicated subwoofer, or as separate stereo speakers plus a front speaker and subwoofer. The front speaker enhances dialogue and the subwoofer provides plenty of bass. The unit can be connected wirelessly to your TV. 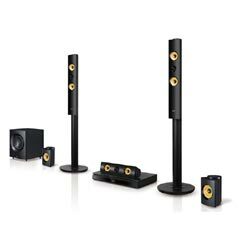 Samsung HT-F4500 review - The Samsung HT-F4500 is a Blu-Ray home cinema system with 5 speakers and a separate subwoofer. The system supports 2D and 3D Blu-Ray playback and DVD with 1080p upscaling. Total power output is 500W. Samsung HT-F5500 review - The Samsung HT-F5500 is a powerful 1000W Blu-Ray home cinema system with 5 speakers and a separate subwoofer. The system supports 2D and 3D Blu-Ray playback and DVD with 1080p upscaling. Smart TV services are available via the built-in Wi-Fi. Samsung HT-H5500 review - The Samsung HT-H5500 is a reasonably-priced home theatre system consisting of a Blu-Ray player, centre speaker, 4 satellite bookshelf speakers and a passive subwoofer. All the essentials are covered here, including full surround sound, 3D Blu-Ray playback and DVD upscaling, plus CD playback and an FM radio. Basic Smart TV functionality with Catch up TV and Netflix is also included, with built-in Wi-Fi and connectivity with compatible smartphones. Samsung HW-F350 review - The Samsung HW-F350 is an entry-level soundbar that delivers 3D audio with a separate subwoofer for extra bass. The system connects to your TV and to any USB audio device such as a smartphone or MP3 player. Samsung HW-F355 review - The Samsung HW-F355 is a soundbar that delivers 3D audio with a separate subwoofer for extra bass. The system connects wirelessly to a compatible TV using Bluetooth, and to any USB audio device such as a smartphone or MP3 player. Samsung HW-F450 review - The Samsung HW-F450 is a powerful 280W soundbar that delivers 3D audio with a separate wireless subwoofer for extra bass. The system connects to your TV wirelessly and to any USB audio device such as a smartphone or MP3 player. Samsung HW-F550 review - The Samsung HW-F550 is a powerful 46-inch 310W soundbar that delivers 3D audio with a separate wireless subwoofer for extra bass. The system connects to your TV wirelessly and to any USB audio device such as a smartphone or MP3 player. Samsung HW-F551 review - The Samsung HW-F551 is a silver-coloured version of the HW-F550. It's a powerful 46-inch soundbar with a separate wireless subwoofer. Samsung HW-F750 review - The Samsung HW-F750 is a premium 46-inch soundbar with Valve amplifier that delivers 3D audio with a separate wireless subwoofer for extra bass. The system connects to your TV wirelessly and to any USB audio device such as a smartphone or MP3 player. 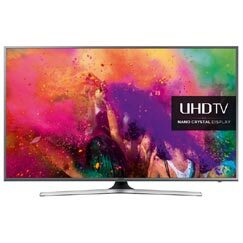 Samsung HW-F751 review - The Samsung HW-F751 is a silver-coloured version of the HW-F750. It's a premium 46-inch soundbar with a separate wireless subwoofer. Samsung HW-F850 review - The Samsung HW-F850 is a premium 55-inch soundbar with Valve amplifier that delivers 3D audio with a separate wireless subwoofer for extra bass. The system connects to your TV wirelessly and to a smartphone or MP3 player via USB or NFC. Samsung HW-H750 review - The HW-H750 is a soundbar with a vacuum tube amplifier for richer sound. 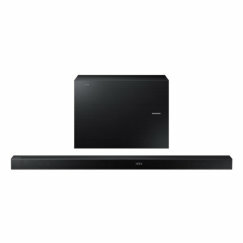 A Bluetooth connection enables the soundbar to be used wirelessly with a compatible Samsung TV. Sony HT-CT260 review - The Sony HT-CT260 is a wireless soundbar with a separate wireless subwoofer for additional bass. You can connect the soundbar to your TV or stream music from your PC, tablet or smartphone via Bluetooth. Sony HT-CT370 review - The Sony HT-CT370 is a soundbar with an active wireless subwoofer for additional bass. The system supports wireless streaming via Bluetooth and can be connected to your home cinema system via 3x HDMI inputs and 1x HDMI output. Sony HT-CT60 review - The Sony HT-CT60 is an entry-level soundbar that delivers 3D virtual surround sound with a separate subwoofer for additional bass. Sony HT-CT770 review - The Sony HT-CT770 is a powerful soundbar with an S-Master amplifier, twin speakers with built-in tweeters and woofers, and a separate dedicated wireless subwoofer. You can stream music wirelessly from a compatible device via Bluetooth. Yamaha YAS-101 review - The Yamaha YAS-101 is a compact soundbar with a built-in subwoofer for additional bass. Yamaha YAS-152 review - The Yamaha YAS-152 is a wide soundbar designed for use with a large screen TV (55 inches or more). It includes dual built-in subwoofers for additional bass. It also supports Bluetooth wireless music streaming from smartphones or tablets. Yamaha YAS-201 review - The Yamaha YAS-201 is a slim soundbar with a separate wireless active subwoofer for extra bass.